Zip file that contains MAXENT output files in ASCII format. Full details for the 17 warbler species can be found in the text. Identifying the factors that influence geographic range limits can illustrate the various ecological, physiological, and evolutionary constraints imposed on a species. The range limits of migratory birds are particularly challenging to study as they occur in disjunct regions at different times of the year, which can impose different constraints. Travel between breeding and wintering regions poses a significant energetic and navigational challenge to birds, although it is not clear how these movements influence breeding dispersal and range expansion. 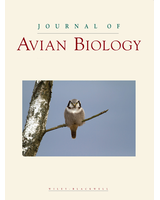 Here I ask whether the possible costs of migration limit the breeding ranges of wood warblers, a group of birds with an extensive history of ecological and evolutionary studies. I used occurrence records for multiple wood warbler species, breeding primarily in the boreal forest of North America, to generate environmental niche models. I tested for over-prediction of habitat suitability into the western boreal forest, where most these species do not have occurrence records but where there is presumably suitable habitat. I found that these vagile taxa, primarily found east of the Rocky Mountains, also have predicted habitat suitability that extends into the north and west, where they have little to no occurrence records. I discuss several possible explanations for this discordance. In particular, the patterns are consistent with the costs of a long-distance migration limiting the benefits of range expansion, as migration may become too onerous as the distance between breeding and wintering areas increases. These results speak to the process of niche filling more generally and call attention to an under-appreciated explanation for why migratory species may not fully occupy their fundamental niche.